We are familiar with images of foxes and badgers feeding in our British gardens - but not this creature. This ‘raccoon dog’ has been spotted in Kirton - and late last night (Monday) the creature was safely captured and rescued by The Ark exotic animal rescue.Monday 17.10pm: The animal, a type of wild dog native to East Asia, is believed to have either escaped from a local exotic pet owner - or been abandoned.While the creatures have a very similar appearance and markings to raccoons, the species are closer relatives to foxes.This image of one enjoying a bowl of food was shared online by The Ark wildlife park and exotic animal rescue, which has seven of the creatures at its site in Stickney - but this is not one of them.Writing on their Facebook page, a spokesman said: “We’ve had a call about a sighting of a raccoon dog in a garden in the Kirton. 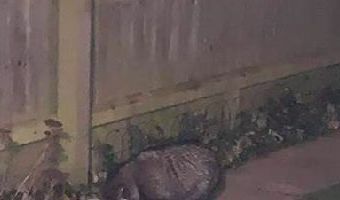 “We are currently looking around the area but it could be in back gardens/sheds seeking shelter.“It … [Read more...] about UPDATE: What is this raccoon-like creature spotted in a garden near Boston?